Electronic cigarettes, also known as e-cigarettes or e-vaporizers, are battery-operated devices that deliver nicotine with flavorings and other chemicals to the lungs in vapor instead of smoke. E-cigarette companies often advertise them as safer than traditional cigarettes because they don't burn tobacco. But researchers actually know little about the health risks of using these devices. Read more about e-cigarettes in our Electronic Cigarettes (e-Cigarettes) DrugFacts. How can people get treatment for nicotine addiction? Both behavioral treatments and medications can help people quit smoking, but the combination of medication with counseling is more effective than either alone. The U.S. Department of Health and Human Services has established a national toll-free quitline, 1-800-QUIT-NOW, to serve as an access point for anyone seeking information and help in quitting smoking. This ruling includes restricting sale of these products to minors. For more information, see the FDA's webpage, The Facts on the FDA's New Tobacco Rule. Behavioral treatments use a variety of methods to help people quit smoking, ranging from self-help materials to counseling. These treatments teach people to recognize high-risk situations and develop strategies to deal with them. For example, people who hang out with others who smoke are more likely to smoke and less likely to quit. Nicotine replacement therapies (NRTs) were the first medications the U.S. Food and Drug Administration (FDA) approved for use in smoking cessation therapy. Current FDA-approved NRT products include chewing gum, transdermal patch, nasal sprays, inhalers, and lozenges. NRTs deliver a controlled dose of nicotine to relieve withdrawal symptoms while the person tries to quit. Bupropion (Zyban®) and varenicline (Chantix®) are two FDA-approved non-nicotine medications that have helped people quit smoking. They target nicotine receptors in the brain, easing withdrawal symptoms and blocking the effects of nicotine if people start smoking again. Can a person overdose on nicotine? Nicotine is poisonous and, though uncommon, overdose is possible. An overdose occurs when the person uses too much of a drug and has a toxic reaction that results in serious, harmful symptoms or death. Nicotine poisoning usually occurs in young children who accidentally chew on nicotine gum or patches used to quit smoking or swallow e-cigarette liquid. Symptoms include difficulty breathing, vomiting, fainting, headache, weakness, and increased or decreased heart rate. Anyone concerned that a child or adult might be experiencing a nicotine overdose should seek immediate medical help. 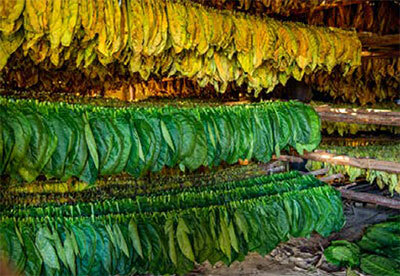 Tobacco is a plant grown for its leaves, which are dried and fermented before being put in tobacco products. Tobacco contains nicotine, the ingredient that can lead to addiction. People can smoke, chew, or sniff tobacco. Nicotine acts in the brain by stimulating the adrenal glands to release the hormone epinephrine (adrenaline) and by increasing levels of the chemical messenger dopamine. Tobacco smoking can lead to lung cancer, chronic bronchitis, and emphysema. It increases the risk of heart disease, which can lead to stroke or heart attack. Smoking has also been linked to other cancers, leukemia, cataracts, and pneumonia. Smokeless tobacco increases the risk of cancer, especially mouth cancers. Secondhand smoke can lead to lung cancer and heart disease as well as other health effects in adults and children. For many who use tobacco, long-term brain changes brought on by continued nicotine exposure result in addiction. Both behavioral treatments and medication can help people quit smoking, but the combination of medication with counseling is more effective than either alone. Nicotine overdose is possible, though it usually occurs in young children who accidentally chew on nicotine gum or patches or swallow e-cigarette liquid. Anyone concerned that a child or adult might be experiencing a nicotine overdose should seek immediate medical help. For more information about tobacco products and nicotine, visit our Tobacco/Nicotine webpage. For more information about how to quit smoking, visit smokefree.gov. NIDA. "Cigarettes and Other Tobacco Products." National Institute on Drug Abuse, 6 Jun. 2018, https://www.drugabuse.gov/publications/drugfacts/cigarettes-other-tobacco-products. NIDA. Cigarettes and Other Tobacco Products. National Institute on Drug Abuse website. https://www.drugabuse.gov/publications/drugfacts/cigarettes-other-tobacco-products. June 6, 2018.